A small family site with a big atmosphere. Kick your shoes off, sit back with a tea or coffee, unwind and recharge in a beautiful landscaped valley. The sound of the babbling stream harmonises with the robins and song thrush and without a car or house in sight, you have found a bit of Cornish bliss. In the Spring the valley has a yellow and green palette, we have Silver Aspen trees, yellow gorse, daffodils and Primulas. Spring lambs calling in the fields. In the Summer the blue and lilac Agapanthus and abundant Buddleia attract the butterflies and dragon flies. Autumn brings plenty of berries to harvest, blackberries, Sloe berries, rosehips. Rabbits are a plenty on the land but you will need to keep a keener eye out for the deer and resident Stoat, who forage under the maze of swallows and starlings. In addition to the beautiful, relaxing Camp Site and Glamping Tents, you can, if you wish, park the car up for days! During our peak season we hold art & craft workshops for those that are game to explore their untapped talents and have fun with us. If you enjoyed crafts, Sewing Bee and Great British Bake Off, you will love being part of this. A Farm Shop (new for 2015) will sell essential produce, all locally sourced produce as much as we possibly can. e.g. Padstow Chough Bakery breads, flans,pies,cakes. Artisan Breads (e.g. organic, spelt), Farm Dry cured bacon and homemade sausages. Free Range eggs from a local small holding! Brand new toilet and shower facilities (new for 2016) - each with 4 toilets, 3 shower (all hot water), disabled toilet,. Hair dryer, shaver socket. Awarded Loo of the Year Award 'PLATINUM' status. Link to Construction Album. 1 communal kitchen chalet - with 2 x 2 gas hob cookers, 2 grills, small microwave. 1 double sink and drainer. 2 fridges, small freezer. You are requested to bring your own kitchen utensils, crockery and cutlery. A few pots, pans, plates and cups are available to help guests. FREE hot water for washing up. Natural setting – no roads or houses in sight. Benches and tables for sitting and picnics. Pop up Victorian Tea room. Water points closely accessible to all pitches. Rubbish bins and Glass and Recycling bins. 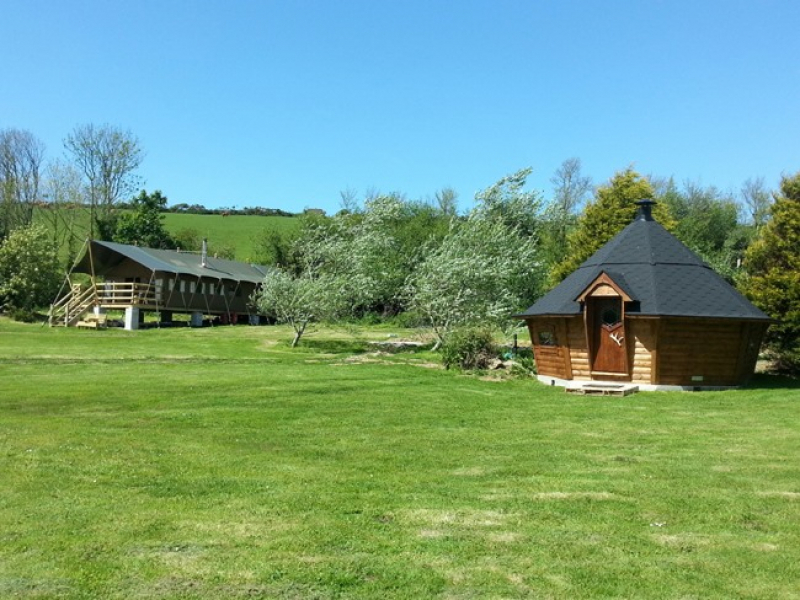 This is a small site with lots of character, ideal for couples and families alike. Sorry but it is not suitable for 18-30 year olds wanting to party. It is available to young people if they want a quiet camping holiday and happy to abide by Coastal Valley rules without enforcement by Coastal Valley management. Having not been to cornwall in a long time we were a little unsure on which campsite to pick. I came across this gem on the Cool Camping website, and was immediately drawn to it. We originally chose a different site, but they couldn't fit us in, and I am so glad that they couldn't because we have fallen in love with this place! From the moment we arrived I knew that this place was a bit special. Hidden away, nestled in a quiet valley, but only a short walk from the beach, beautifully natural and yet very well kept. The owners Tanya and Andy were so lovely, and made us feel at home, regular popping by to say hi to everyone whilst doing their chores. Andy even cut a huge grass stick for my son because he heard him crying and played with him for a while which cheered him up no end! They are a fountain of knowledge when it comes to places to visit, even the less 'touristy' places, and are great when it comes to suggestions for bad weather. We had an amazing time, and will definitely go back when we next visit Cornwall. Thanks guys for an amazing stay! We stayed here during half term with our toddler and it was perfect for a rustic family break but with enough facilities to make life for a busy family relaxed and enjoyable. We're used to camping but because we were attending a wedding we wanted a little bit of comfort and it was perfect. I have stayed in quite a few pods and this was by far the best, our travel cot fitted comfortably and it all the utensils required for self catering so no packing up of pots an pans etc! Because we have a dog we decided that I would stay with our toddler in the tent and my partner stayed outside in a pup tent with the dog. It worked really well because there is a huge outside area as well as a patio so lots of privacy and space for our little one to run around. And it was SUCH a luxury to have a bathroom. This is a perfect compromise for families, and lovely to be able to watch the chickens pottering around from your patio. I wouldn't hesitate to come back. Tanya and Andy are two of the friendliest, helpful and nice people you'd like to meet. Nothing is too much trouble and they make sure you have the best time. Great facilities - love the farm shop! You feel like you're in another world at Coastal Valley - it has the best vibe. We stayed in the Airstream which was a phenomenal experience! As I said to Tanya, I don't really want to tell anyone how good it is I want to keep it all to myself! We'll definitely be back, probably camping next time, but I will be staying in the safari hut before too long!! Couldn't recommend it more.